MANILA -- Troops are trying to validate intelligence information that a Malaysian terrorist leader survived the defeat of an Islamic State group-linked siege and is helping restart efforts to establish an extremist alliance, a military official said Wednesday, January 17. Brigadier General Cirilito Sobejana said troops were trying to validate reports that Amin Baco was wounded during the siege of Marawi City in Mindanao but managed to escape to Sulu province, where he is hiding with Abu Sayyaf bandits. Rebel leader Yusop Jikiri of the Moro National Liberation Front, which has a peace treaty with the government, told The Associated Press that his group received information that Baco is being protected by Abu Sayyaf commander Hatib Hajan Sawadjaan, the Malaysian terrorist's Filipino father-in-law, in the mountains off Sulu's Patikul town. Sawadjaan is a notorious kidnapper linked to several abductions of foreign tourists. "We also got that information and we're validating it," Sobejana said. "Our efforts against this group have been relentless." Abu Amri Taddik, the rebel intelligence chief of Jikiri's group, said Baco was involved in renewed efforts to establish an IS-linked alliance of several groups including the Abu Sayyaf. A Sulu-based Abu Sayyaf commander, Yassir Igasan, is a key candidate to succeed Isnilon Hapilon, who led an emerging IS-affiliated alliance in Southeast Asia until he was killed when government troops crushed the five-month Marawi siege in October, Taddik said. Military officials had said that Baco, who was hiding in Mindanao for years, was among the terrorists killed in Marawi although his body was not found. A longtime rebel fighter who has served as Sulu governor and later as a congressman, Jikiri heads one of two major factions of his rebel group and had organized nearly 400 fighters to help the military combat kidnappings and terrorism. "We'd like to clean the name of Sulu and the Tausugs," Jikiri said, referring to Sulu's dominant ethnic group. 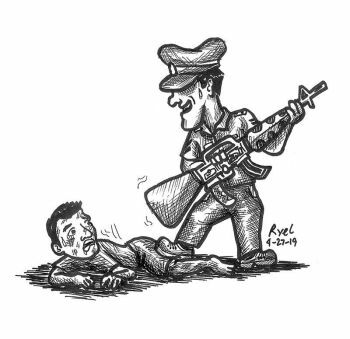 "I hope the Abu Sayyaf will stop kidnappings and all sort of criminalities to avoid any more bloodletting." Sobejana welcomed the rebel move and said arrangements were being finalized to determine how the guerrillas could help troops. "What is clear is they are already providing us with information," he said.